Glenda Bates is a multi-faceted international musician, performing extensively as a professional freelance oboist. Her focus is chamber music, historical performance, and contemporary works for oboe and English horn. She has extensive orchestral experience on both oboe and English horn, including performances with the Salisbury Symphony, Capital City Symphony, Piccolo Spoleto Festival Orchestra, St. Gregory Chamber Orchestra, and the Clarus Ensemble. She has performed at Symphony Space, Lincoln Theater, and the Kennedy Center. An advocate of “right now” music, she has premiered over a dozen works by living composers, including Peter Winkler, Perry Goldstein, Robert Gibson, Daria Semegen, Andrew Conklin, Richard Dubras, and more. 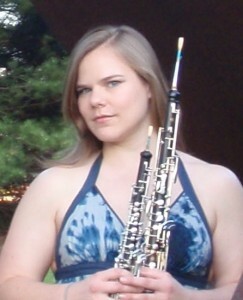 An avid early music enthusiast, Glenda also plays the Baroque oboe, performing in Boston Early Music Festival in 2011. Constantly pushing boundaries and blurring lines, she recently premiered a contemporary work for solo Baroque oboe dedicated to her by composer Tomek Regulski entitled “Wind”. Glenda values the importance of improvisation in developing personal voice and expression in performance, and practices both free improvisation and jazz improvisation. In addition to playing jazz oboe, she is an accomplished Jazz vocalist, performing with such names as Ray Anderson, Eldad Tarmu, Bert Ligon, Rafi Malkiel, and Jenna McSwain. A well-rounded and exemplary performer, Glenda loves sharing the power of music with others through teaching. She has held a private oboe studio since 2003, with students ranging from ages twelve to seventy-three. She taught undergraduate oboists while at the University of Maryland from 2008-2010, and has classroom teaching experience in several areas of instruction including music appreciation and rock music. She is an enthusiastic and creative teacher, held in high regard by students and teachers alike. Glenda is currently a Doctoral Candidate at Stony Brook University under the tutelage of Professor Pedro Diaz, English horn soloist at the Metropolitan Opera. She earned her Master’s in Music from the University of Maryland, and her Bachelor’s degree from the University of South Carolina. Previous teachers include Mark Hill, Rebecca Nagel, Carol Stephenson, and Susan Vought-Findley. She has also studied with Marc Schachmann, Arthur Haas, and Helene Devilleneuve.